"Technical" discussions among officials took place on Monday evening. Sources indicated the PM had not accepted Labour's customs union demand, but there was a move towards changing the non-binding political declaration. Labour leader Jeremy Corbyn said there had been no change in the government's "red lines". A Downing Street spokesman said the government was "committed to finding a way through" which requires both sides "to work at a pace". Commons Leader Andrea Leadsom told MPs that if this happens on Monday evening, there will be a government motion on Tuesday asking the House to approve the PM's request to the EU to delay Brexit until 30 June. 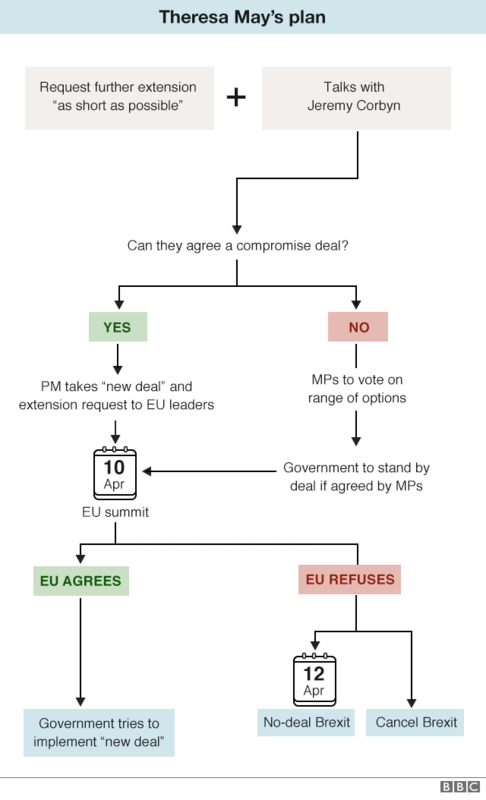 During the cross-party Downing Street talks, the government reportedly suggested offering Labour a guarantee that any deal they reached could not be undone, creating a "lock". This would aim to ease Labour concerns that any promises could be unpicked by the next Conservative leader. But BBC political editor Laura Kuenssberg said there was "deep concern" on the Labour side that any legal promise could be undone by further legislation. However, the prime minister was warned by members of the 1922 committee of Conservative backbenchers that agreeing a customs union with the EU in Brexit talks would be "unacceptable". Mr Corbyn said: "Talks have to mean a movement and so far there's been no change in those red lines." The Labour leader said there were "many concerns" his party had over the political declaration - a plan for the future relationship with the EU - which it planned to put to the government in their discussions. On Monday, EU chief Brexit negotiator Michel Barnier met Irish Taoiseach Leo Varadkar in Dublin and told reporters he hoped the UK's cross-party talks would "produce a positive outcome". But he said that, if the UK left the EU without a deal, "we will not discuss anything with the UK until there is an agreement for Ireland and Northern Ireland, as well as for citizens' rights and for the financial settlement". The EU would "stand fully behind Ireland" regardless of what happens with Brexit, he added. Mr Varadkar said he was open to extending the Brexit deadline to allow discussions to "continue their course".